It's good to walk a mile in your client's shoes. But is it even better to walk 125 miles? Le Balene will soon find out. The Italian agency is wooing an unnamed mobile accessories client with a unique stunt: Pitch them by walking from the agency's home in Milan to the client's office in Reggio Emilia—a distance of some 200 kilometers, or about 125 miles. 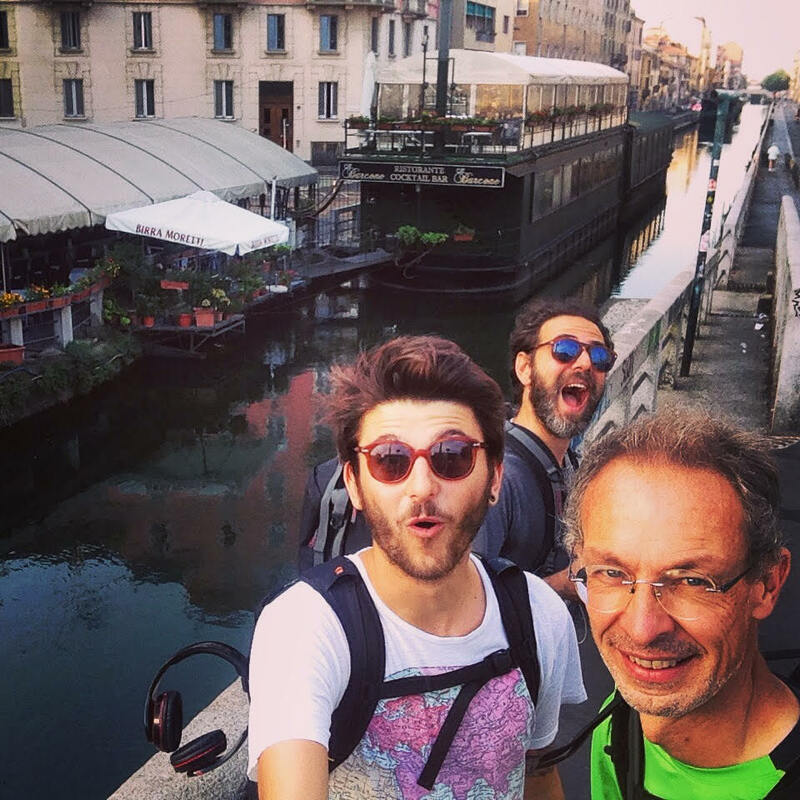 Creatives Davide Canepa and Francesco Guerrera, accompanied by their fearless leader, CEO/account director Marco Andolfato, set out last Friday. If all goes well, they'll arrive this Friday, in time for their 10 a.m. meeting. The walk has taken them through country roads and forests, and across rivers. They're recording, tweeting and blogging—and even servicing other clients—along the way, using only mobile phones and tablets. The campaign is tagged #mobileworkers. You can follow their adventures on their blog (that is, if you read Italian; otherwise, hit up Google Translate and enjoy the pictures). Check out our Q&A with Andolfato below, along with a special video shout-out to Adweek readers. Marco Andolfato: We want to demonstrate that technology is an enabler of whatever you want to do. Every worker is a mobile one these days, and every worker can use technology to work better. As advertising people, to work better we need to take more time to think, and technology is helping us to savor slowness, and to think faster. So, we decided to walk the 200 kilometers from our office to the client's, working on the presentation while on the journey. Can you tell us about the client and the brief? The client deals with accessories for mobile devices. Usually people are much more interested in devices than in accessories. But accessories allow you to make the best use of the technology; they are your enablers. Much more so if you are a worker. Along the road we're using rechargers, selfie sticks, headphones, all kind of cables, iPhone covers. Without them we couldn't have worked on the road. And our beautiful ideas wouldn't have reached the client. How will you use #mobileworkers to pitch? We are preparing a movie—shooting during the days and editing it during the evenings. This should exemplify the idea, but just in case, we're preparing 4/5 strategic slides. Of course, we're planning to enter the meeting room with backpacks and boots. How far have you gotten? How long will it take you to finish? We started Friday from our office and walked 137.8 kilometers so far [as of July 28]. The presentation is Friday at 10 a.m., hopefully! Does the client know you are walking? You mean physically? I ran a marathon in Copenhagen two months ago. Davide is 27, and Francesco's real fuel is creativity. Has anything interesting, notable or cool happened during your walk so far? Every evening Davide has to choose among too many things before writing the travelogue. We are following the "Via Francigena," the route followed 1,000 years ago from the archbishop Sigeric to get back to Canterbury from Rome. So people are very nice with us "creative pilgrims." We crossed the river Po with a small boat on the same point as Sigeric did, and the boatman had his own special opinion about "slowness." In a small town, we were hosted by the mayor in the local ex-Benedictine monastery—and he dined with us in the evening, calling a local journalist to have the news on the newspaper. And we've got a new client, as I'll explain later.